With soothing music playing in the background, Professor Norman Rumble clasps his hand over his mouth as he stares down upon his creation glaring back at him. Mystified, there is only one question on his lips… Why? There are only two people in the world who know the answer to that… and they’re fishing. Hold on tight while Chalice transports you to Cambodia with its spectacular temples, sun-drenched beaches, and lush tropical islands. In Chalice, the second part of the Siam Storm adventures, our lovable rogues are back causing more mayhem around the mystical orient. Pon, the mad monk, now wears a bad mullet; Nick, Mr Calamity, finds out what the view is like up a cows botty, and Spock and Stu… go fishing. 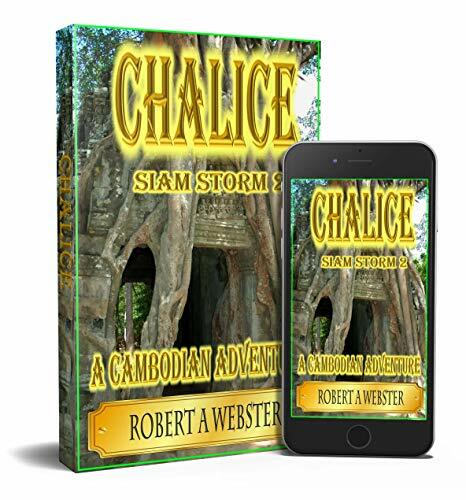 Hop aboard this high-octane hilarious adventure and grab a copy of Chalice - Siam Storm 2 today and find out what else happens from Cleethorpes to Cambodia with adventures in between.